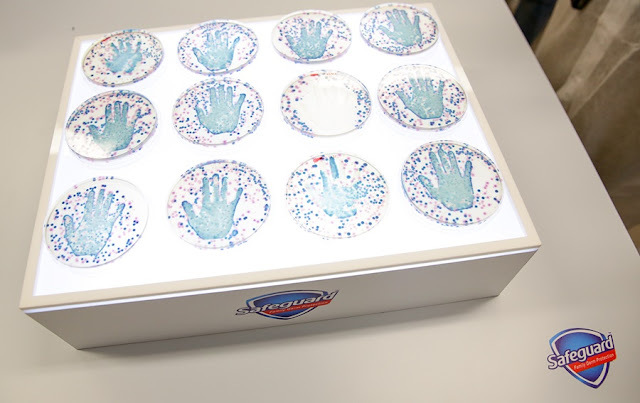 We've learned so many things about germs and Safeguard during our recent trip to Safeguard Innovation Center last March. 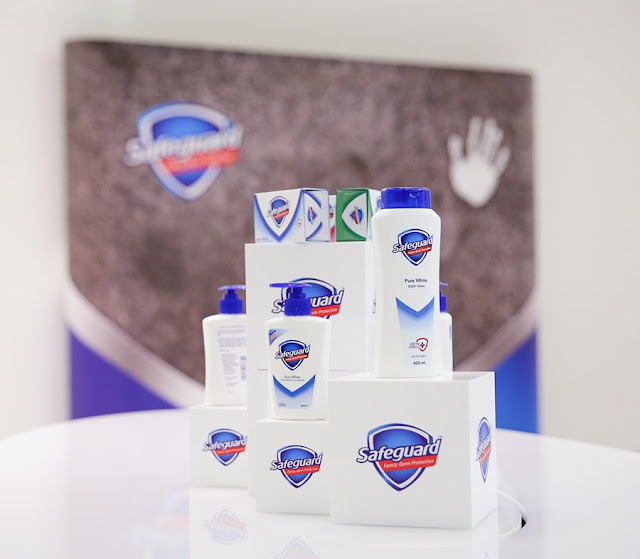 We also discovered the science behind Safeguard and why for more than 50 years, they remain the number one antibacterial soap in the Philippines. Medical technologist and PAMET showed us different kinds of germs in the environment that is also present in our homes. It's gross to know that germs lurk in the things that we use everyday that's why proper handwashing is a must. Have you read my Safeguard Science Discovery Tour post already? I've mused in that post what are the types of germs that causes disease in the family and why it is important for us to wash our hand using antibacterial soap. Now, get to know more of Safeguard and the variants that you can use from head to toe. See Safeguard products below and how moms should protect their families' health with trusted germ protection everyday. GermShield+ refers to the active ingredient that makes Safeguard with GermShield+ uniquely effective at inhibiting the growth of disease-causing germs on your loved ones long after hand washing. Protect your family from the germs that cause 75% of all childhood illnesses with Safeguard Pure White bar soap—the doctor-recommended protection you trust, with the classic Safeguard fragrance you love. Now with triple shield technology, provides continuous action that help reduce the re-growth of 3 types of germs in between washes- skin infection and odor-causing bacteria, common disease-causing bacteria and fungi. Protect your family from the germs that cause 75% of all childhood illnesses with Safeguard Pure White body wash—the doctor-recommended protection you trust, with the classic Safeguard fragrance you love. instructions for use: Take a coin sized amount of Safeguard Body Wash onto a wet puff. Work up a rich lather with the puff as you gently scrub from head to toe. Rinse and pat dry. Safeguard Antibacterial liquid hand soap that is 100% recommended by global health experts helps protect your family and removes up to 99.9% of germs! instructions for use: Rub hands gently and rinse with water until clean. Experts proved to us during our Safeguard Science Discovery Tour that Safeguard can provide long-lasting superior protection from modern-day germ threats. 1. With thousands of germs everywhere, you and your family are constantly exposed and at risk of infection. 2. Safeguard provides all-day unbeatable germ protection from modern-day germ threats. 3. Safeguard is recommended by health experts for superior skin germ protection. In an environment as humid as a bathroom, a single bacterial cell can multiply into one billion cells overnight. When someone comes to work sick, about half of the commonly touched surfaces in the office will become infected with the virus by lunchtime. You have read the disturbing data above so in my opinion, it is imperative for all members of the household, especially children, to use a soap that can kill these germs effectively and prevent their regrowth. Your protection against germs and bacteria begins with handwashing and bathing properly using an antibacterial soap like Safeguard. Like what I've said in my previous post, my husband is a fan of Safeguard ever since and I guess the very reason why he doesn't need to use deodorant because of Safeguard. It's only a theory of mine but based on my observation bathing three times a day using only Safeguard proves that. Safeguard with Germshield+ technology can fight a broad spectrum of gram-positive and gram-negative bacteria and fungi, preventing more types of sickness, malodour, and skin infection. Moreover, Germshield+ technology inhibits the regrowth of these bacteria and fungi up to 24 hours, thereby providing optimal protection. For over 50 years in the Philippines, Safeguard has been recommended by the leading health experts for germ protection for the entire family. Protect your family from germs and diseases by encouraging proper hygiene, frequent handwashing, and the use of Safeguard, which makes your job as protector of the family easier and more effective.